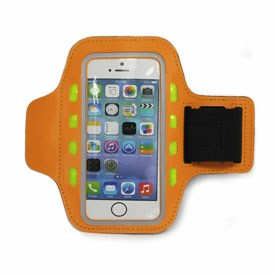 Stay safe and connected while running, walking, hiking or biking when you are wearing the LED armband cellphone holder. Armband has easy access to earphone and controls to avoid screen moisture. Pricing includes: - choice of case color: black, red, hot pink, light pink, orange, gray, white, purple, dark blue or light blue - LED with 2 modes: blinking or steady - reflective strip around phone window - convenient key holder - adjustable armband fits securely to most arms - imprint area: 27mm x 30mm - 1 PMS color screen print design Production time: 3 weeks after artwork approval.